DVD Audio Ripper, easily rip DVD audio to MP3, WAV, WMA. 3herosoft DVD Audio Ripper is the best DVD Audio Ripper and DVD Audio Extractor which can extract DVD audios to MP3, MP2, M4A, WAV, WMA, AAC, AC3, OGG, RA audio formats with excellent sound quality. 3herosoft DVD Audio Ripper lets you easily extract DVD audio to almost all popular audio formats for playback on iPod nano, iPod shuffle, iPod touch, iPod touch 4, iPhone 3G, iPhone 3GS, iPhone 4, iPhone 4S, iPhone 5, iPhone 5S/5C, iPad, iPad 2, the new iPad, iPad 4, iPad mini, Zune, PSP, iRiver, Archos, Creative, etc. multimedia players. This powerful DVD Audio Ripper provides multiple editing functions for your setting, such as video trimming, batch conversion, Video and Audio Bit Rate, Resolution, Frame Rate, Sample Rate, Aspect Ratio, etc. 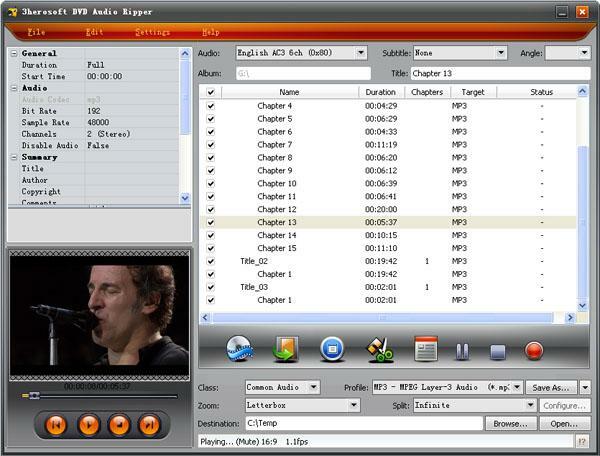 3herosoft DVD Audio Ripper allows you to select DVD subtitle and audio track to convert DVD. With this best DVD Audio Ripper, you can get what you want to fit for your multimedia players with the best quality! Rip audio files from DVDs and save them as MP3, WMA, WAV, M4A, AAC, AC3, and OGG formats. You can get DVD info online like Album Artwork, Album Title, Artist, Producer and more. Split one large file into several smaller audio clips and rip audio clips with different profiles . Get the best audio quality with some parameters to adjust including Sample Rate, Codec, Bit Rate, Channel, Volume, Audio Quality. Trim segment by setting start and end point or drag the slide-bar to confine the trimmed area. With multithreading and batch conversion, DVD Audio Ripper is able to rip several DVD or titles at the same time.